The NIU College of Law was ranked among the top public law schools in the nation based on value by the National Jurist magazine. As part of the 2013 Best Value Law Schools study, NIU Law was named among the top 45 public schools featured on the list, receiving a B+ as the overall rating by the magazine. NIU Law continues to be at the forefront of addressing the important concern of affordability of legal education and reduction of law school debt. On the ranking for public law schools, NIU Law was the only Illinois law school to make the list. “I am proud when NIU Law is recognized for what we have always done extremely well – provide an excellent legal education that prepares students for career success whichever path they choose, while remaining affordable,” said NIU Law Dean Jennifer Rosato. As the only public law school in the Chicago area, NIU Law allows students to obtain their J.D. degree without the weight of incurring as large a debt at the end of their legal education. The average indebtedness of NIU Law students from the Class of 2012 was just over $73,000, compared to a national average of $125,000. There are just more than 200 American Bar Association-approved public and private law schools in the United States. 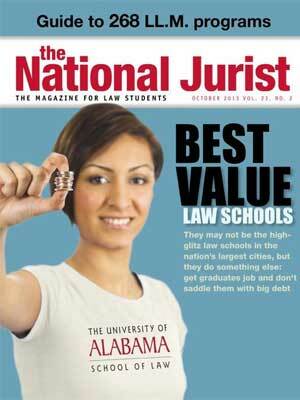 The 2013 Best Value Law Schools study generated its rankings by meeting certain criteria based on bar passage rate, average indebtedness, employment rate and tuition for in-state residents.